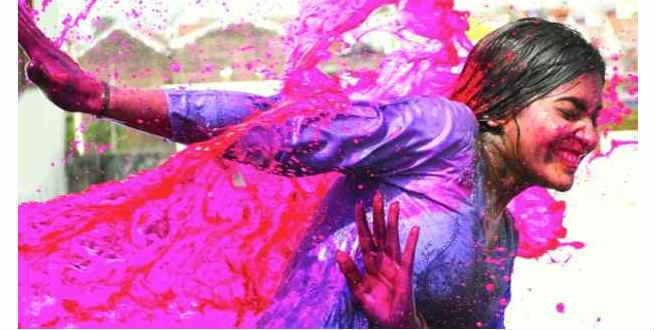 You say “Holi Hai!” and throw colors everywhere, not caring about what is falling on your hair, your face and your clothes. But once the revelry dies down and you return home, you find yourself staring at the mirror at the messed up hair and the stained skin and wonder how long the color will take to wear off and how much damage it has done to your skin and hair. Well, you are not alone. Most of us forget about everything while playing with colors and then stress over it later. But worry not, we tell you here how to take care of hair and skin during Holi. These tips will help you protect your hair from excess damage and help you get rid of the after effects of Holi soon. Following our tips for hair and skin care during Holi, you will be able to cut down the extent of damage done to them. That way, you don’t have to rush to the salon the very next day to get your tresses fixed or to soothe down your skin. Go ahead and read on about how to take care of hair and skin during Holi and have a Happy Holi. 1. Do not indulge in a facial or any other face treatment that will leave your skin sensitive and vulnerable before Holi. You don’t want to damage your skin with colors when it is sensitive. 2. Slather a lot of body lotion or oil all over your skin so that it acts as a protective film between your skin and the colors. 3. Do not skip the sunscreen. On top of the oil or lotion, apply a lot of sunscreen if you are playing during the daytime. 4. Wear full sleeved tops and long bottoms so as to provide your skin maximum possible protection. 5. Keep some aloe vera gel or cucumber juice handy in case you experience any irritation after playing with colors. These are soothing and cooling and bring down inflammation. 6. Once you are back after playing, do not scrub your face harshly. Instead, dust off excess color and then gently remove whatever possible using a cleansing milk or oil. 7. Next, have a bath with a mild soap or a body wash. Use the loofah to remove excess color. 8. A paste of gram flour or besan with some milk also works as a good cleansing agent. 9. The color will take a couple of days to completely wear off, depending on the extent of pigments in it. Until then, use a mild soap and lots of body lotion which will help dissolve all remnants of color from the skin. 10. Just like the skin, apply lots of oil on the hair before stepping out for celebrations. Many believe that it is easy to dust off color from dry skin and oiling attracts the color, but it is not true. Oiling will protect the scalp and also the entire hair shaft. When you wash your hair with shampoo, the color gets removed along with the oil. 11. Do not get any chemical treatments done on the hair prior to Holi. The same holds good for a couple of days after Holi, until all the colors wear off. 12. Do not leave your hair open. Braid your hair or tie it up or use a scarf around it. That way, you are reducing the exposure of hair to the color. 13. After playing with colors, dust off excess color from your hair. Massage your hair with almond or coconut oil. Leave it on for about half an hour before shampooing it off. 14. Shampoo continuously with a mild shampoo for 2-3 days after Holi, after oiling your hair. 15. Make a mask of yogurt with fenugreek powder and apply it all over your hair. Leave for half an hour and then rinse off. This will condition your hair and reduce the extent of damage.